It’s been a while… I’d like to say sorry about that but I’m fairly sure as I’m such a crap ‘blogger’ no-one is actually reading this :) anyway… I’ve been enjoying myself a lot since I last posted in *ahem* September, so I guess I may as well share the fun! All the way back to what feels like a lifetime ago I went to Coachella, road tripped the Pacific Coast Highway, went to San Francisco and Sonoma and Napa Valley… before going to Chicago right at the end of our trip! Check out what we squeezed in to our quick stop in ‘The Windy City’! 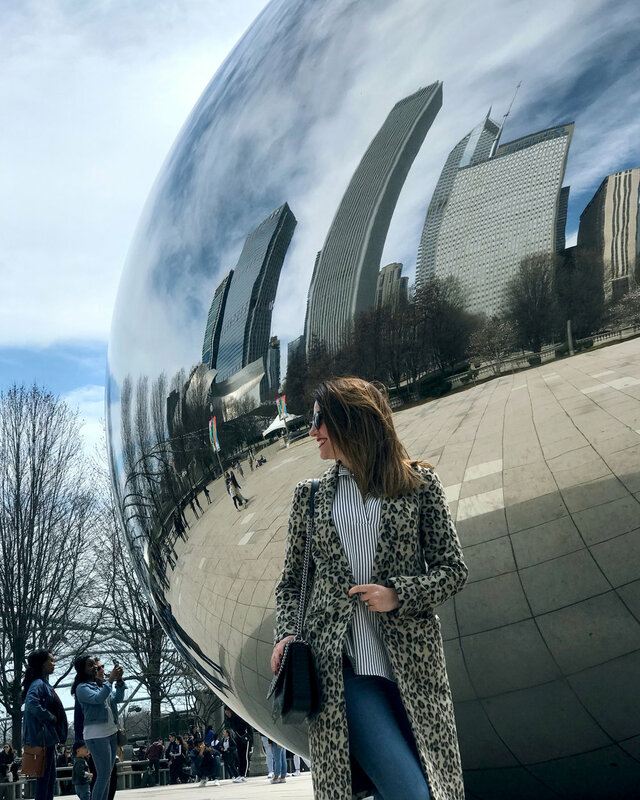 1 - What’s the first thing you think of when you think of Chicago… well if you’re a foodie like me, its Deep Pan Pizza - so first stop, late the evening we arrived, after taking the train from the airport to our hotel downtown was Lou Malnati’s for some epic late night pizza feasting. 2 - The next day was our actual full day to explore the city, but first… Coffee! We stayed at the Congress Plaza, it worked out perfect… it was a last minute booking but location was great. 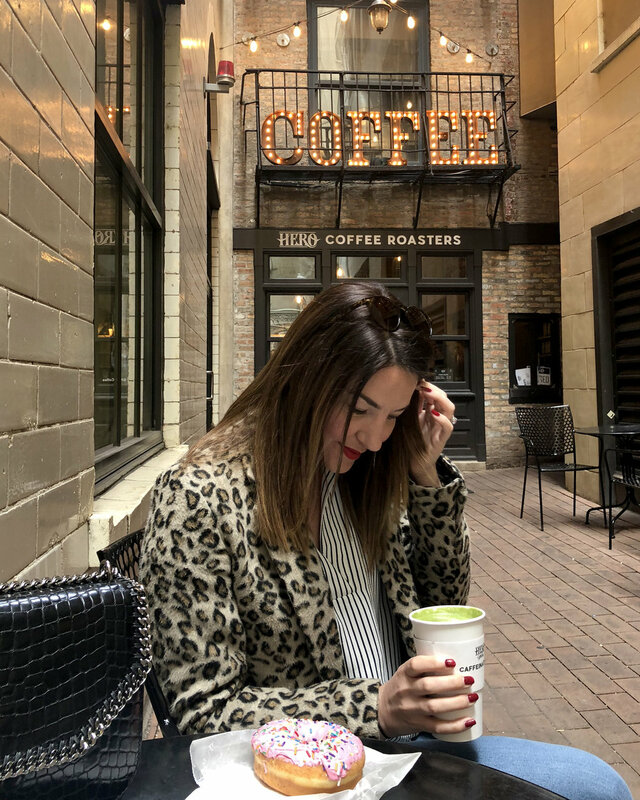 It’s right there on Michigan Avenue so we walked from the hotel down to Hero Coffee Roasters - click for their Instagram. So after a big fat Homer Simpson style donut and some caffeine we were ready to take on the day! 3 - Of course, the iconic Millennium Park to see ‘the bean’! 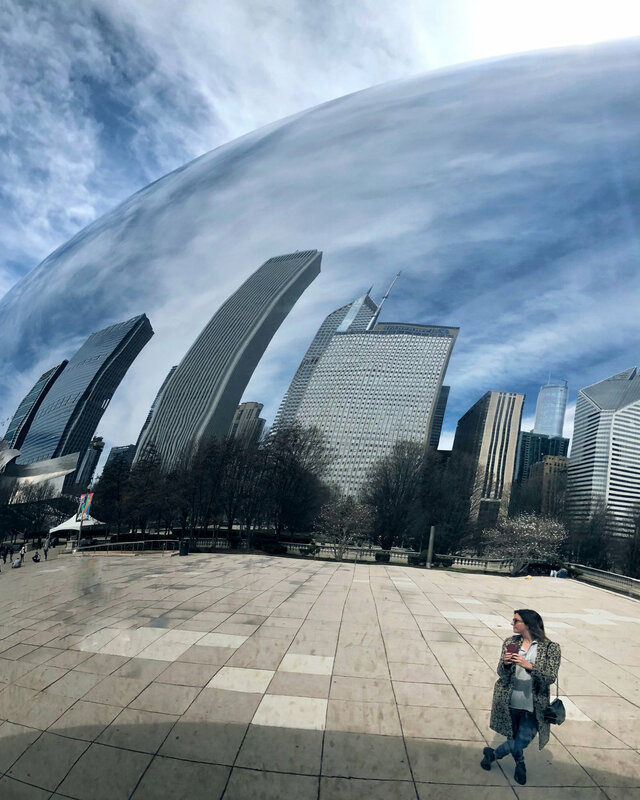 After seeing photographs of the bean for years I have been dying to come here for so long. 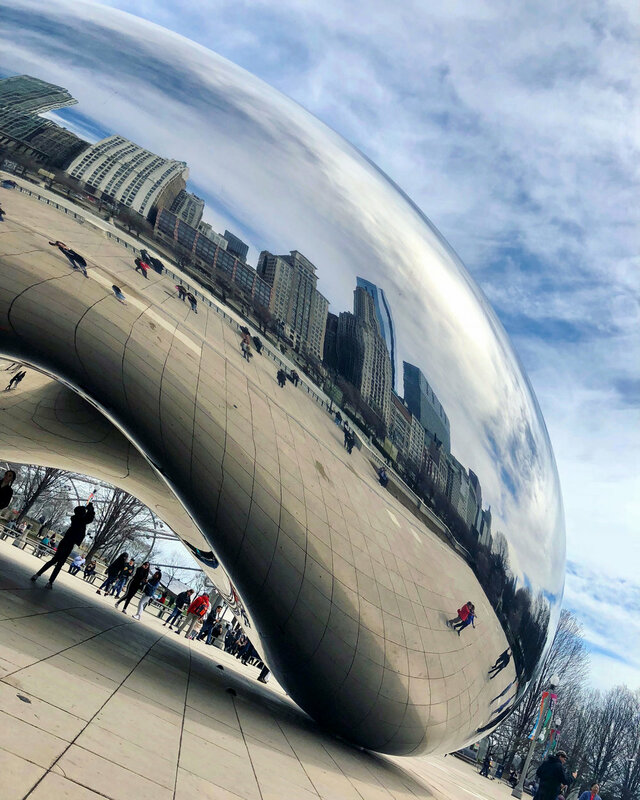 Cloud Gate is the actual name for the huge reflective bean shaped sculpture by Indian-born British artist Sir Anish Kapoor, since 2006. So cool and beautiful! An absolute must when visiting Chicago. 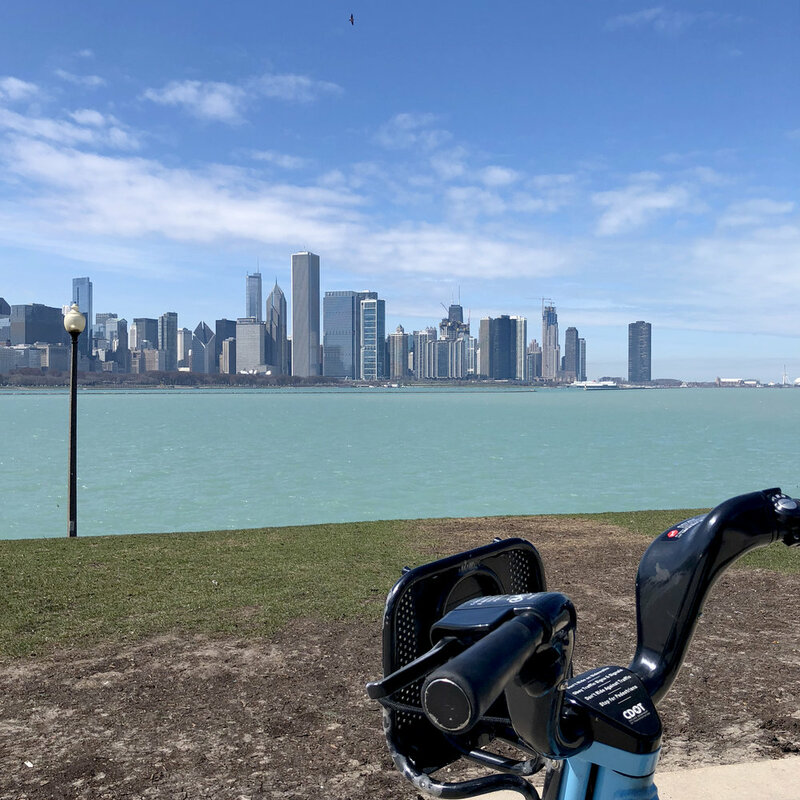 4 - Divvy Bikes! This name still quite entertains me, since where I’m from in the north of England ‘divvy’ is a funny kinda derogatory term, pretty much means stupid ha! They weren’t stupid, they were great! We had limited time and wanted to see as much as possible but also remain outdoors as opposed to Ubering as it was sunny and crisp and lovely. We paid $15 for a day pass, you get the app, sign up with your card details and pretty much off you go! 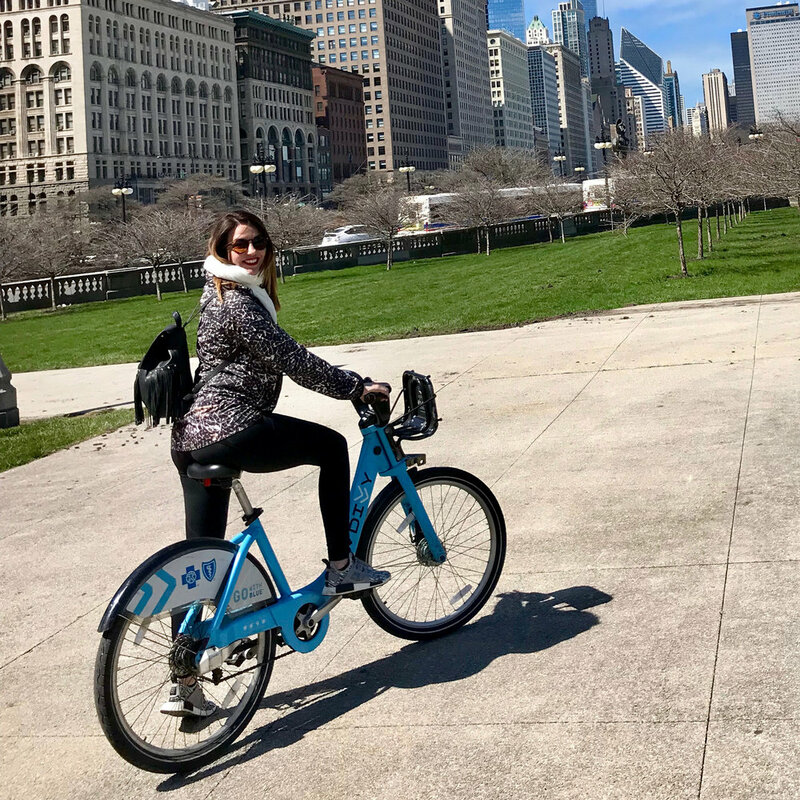 There are bike stations all over the city and you just drop off and pick up a new bike whenever you’ve explored the area. We had a great little adventure, got to see a lot and it was fun! 5 - River Walk… a lovely stroll along the river in the city. The Riverwalk itself is just over a mile long. There’s bars and restaurants along the way with beautiful views right in the heart of the city. See people canoeing and kayaking and bachelorette party boats, just a good scenic people watching stroll. 6 - Street Art Tour, there’s some amazing art to be found. This wasn’t an organised ‘tour’ as such… I’d just read somewhere about the street art on the sides of buildings and various places. There is an area which was close to our hotel, ‘The Wabash Arts Corridor’ WAC… but cool murals can be found all around the city. 7 - Chicago Hot-Dogs! Yesss, the foodie in me is once again delighted! Always wanting to dive in to the local cuisine, a chicago style hot dog stop was obviously a must. We went to Portillo’s - hit for Instagram page. It was delish and we got the added extra entertainment and keepsake of a very beautiful portrait of the two of us from a fellow Portillo’s visitor :) I need to find that, I’d actually forgotten all about it until looking through these photographs. I’d read up about Second City, reviews on Tripadvisor etc and it did not let us down. We were kinda exhausted to be honest from walking and cycling and exploring but we dragged ourselves across town, bought tickets on the door and it was hilarious. 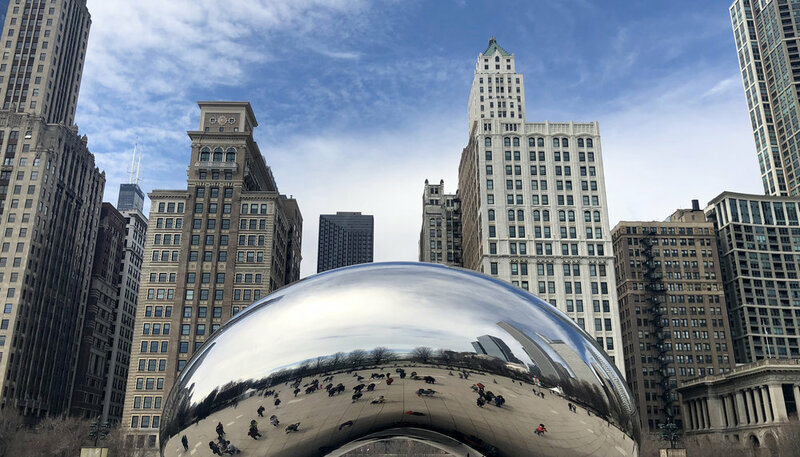 The place is known for its long list of comedians who have gone on to big things, Bill Murray, Steve Carrell, Tina Fey, Amy Poehler, all started here. It was an hour plus long of sketch show style improv, loved it! I’d definitely go again if I’m in the city again overnight, much recommended, if you’re considering it, just do it! So that’s all we squeezed in to our 24 hour whirlwind in the Windy city! Not bad for such a short visit, any tips for my next visit if there’s anything I totally missed out on let me know as i sometimes fly through the city on my way out for work so who knows, i might get another visit in sooner than expected.